Make a pretty angel charm to complete your gemstone bracelet, using Pantone's trending colours for Autumn/Winter 2017! It's the perfect accessory or gift for Christmas. Take a headpin and thread on a bead cap, a 8mm bead, the angel wings, a 6mm bead and finish with a Swarovski star bead. Use your pliers to trim the end of the headpin and turn a loop. Cut a 30cm piece of elastic and string on 1 4mm Swarovski bicone bead, bead cap, 8mm bead, bead cap, 4mm Swarovski bicone, 6mm bead, 4mm Swarovski bicone. Repeat this pattern until you have reached your desired length. 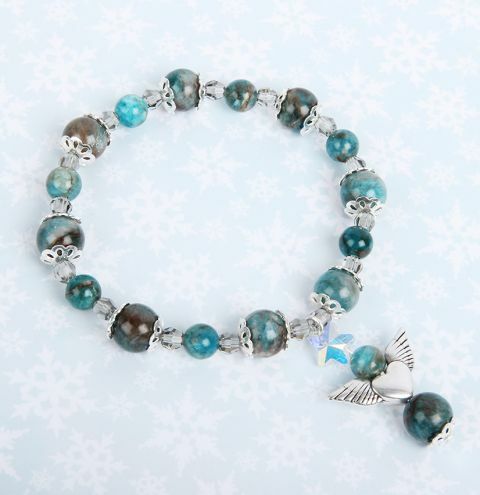 Finish with a 4mm Swarovski bicone bead and then thread on your angel charm. Tie the two ends of elastic in a double knot and you can optionally secure it with a drop of clear nail varnish or Fevi Kwik glue before trimming away the ends.